The winner will be notified and announced prior to the ASA meetings. The winner will be notified and announced prior to the ASA meetings allowing presses to advertise the prize-winning book. A brief nomination letter and a copy of the article or chapter. The winners will be notified and announced prior to the ASA meetings. 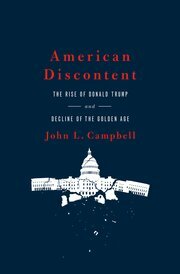 In the fall 2018 newsletter, Alexander Hicks reviewed John Campbell’s American Discontent: The Rise of Donald Trump and Decline of the Golden Age (Oxford University Press, 2018) as part of his essay on two recent books explaining the outcome of the 2016 US election. John Campbell responds to the book review in his piece, “Discontent with American Discontent? A Reply to Alex Hicks.” The full exchange is below. Alex Hicks’s review in the latest newsletter (Fall 2018, pp. 19-21) of my new book, American Discontent: The Rise of Donald Trump and Decline of the Golden Age (Oxford University Press, 2018), is sympathetic to my argument about the structural and historical conditions that led to Donald Trump’s victory in the 2016 presidential election. But he also raises some criticisms that deserve a response. In brief, he got one thing terribly wrong about my argument and missed the point on a couple of others. Without question attributing Trump’s victory exclusively to long-term trends and ignoring the more proximate peculiarities of the election would be wrongheaded and overly deterministic. But that was not what I argued. Moreover, I explained that one reason I wrote the book was to correct the general impression being given by many popular books, newspaper and magazine articles, and media pundits in the months soon after the election that Trump’s victory was simply due to these idiosyncrasies. I wanted to reveal the deeper currents that were also at work. I wanted to balance the debate. To my knowledge, my book is still the only one that does that. The second criticism Hicks levels at American Discontent is that I should have started my historical analysis of the long-term trends that helped Trump win the White House much earlier than the late 1960s and early 1970s, which is where my story begins. In particular, he focuses on my argument that Trump benefitted from the Nixonian-based Southern strategy of dog-whistle racial politics that persisted from that time in various forms right through the 2016 election—a trend upon which Trump capitalized on the campaign trail, often in outrageous terms. Hicks argues that I ignored the historical continuities connecting these post-1960s developments with earlier political shifts stretching back to the late 1930s where the “conservative coalition” of Republicans and Southern Democrats first began to congeal. He is certainly right about the connection there. But that misses the point. On the one hand, insofar as race is concerned, how far back do we need to go for my argument about structural and historical conditions to be satisfying? One can imagine extending the argument back to the post-Civil War Reconstruction era or even farther back to the days of slavery. But I’m not sure there would be much value-added in doing so. On the other hand, and much more important for the book’s primary claim, the late 1960s and 1970s were a pivotal point in my story not just because they witnessed the rising Southern strategy but also because this was a time when economic trends in the United States began to sour, the ideological turn to the right, particularly in economic policy, gathered widespread momentum, and, of course, it all got mixed politically with issues of race. This was a critical structural and historical juncture. So, I would defend the dawn of the 1970s as the appropriate starting point for the story simply because this is where all of the major trends I discussed in the book began to converge in ways that laid the foundation for Trump’s eventual victory. Hicks’s third concern is the flip side of his first one. In his view, I should have paid much more attention to two particularly important idiosyncrasies in the 2016 election. One was the role that Jill Stein and Gary Johnson’s third-party candidacies played in siphoning off votes from Clinton in crucial swing states—Michigan, Wisconsin and Pennsylvania—that many people believe cost her the election. The other was FBI Director James Comey’s October 28 letter to Congress resuscitating concerns that Clinton had mishandled official emails while she was Secretary of State. Without their candidacies and without that letter, Hicks argues, Clinton probably would have carried these three states and won the election. I do not dispute this. But, as I suggested on p. 16 in my book, the larger question remains: Why was the election so close to begin with that these things mattered so much, particularly in these states? After all, based on her résumé Clinton was arguably one of the most qualified candidates for the presidency the nation had ever seen. She also had a formidable campaign war chest and organization behind her. The answer is that the trends identified in American Discontent had reached a point where someone like Trump could win enough support in swing states and elsewhere that the difference between victory and defeat was slim enough that peculiarities like these mattered a lot on election day. Hicks and I may continue to disagree about American Discontent. But I’m sure that the next time we meet we can go out for a beer together and continue the conversation in a civil tone. Too bad that sort of civility has become so rare in American politics these days. Ironically, while Hillary Clinton may have lost due to the defection of third-party voters, her husband won the presidency in 1992 thanks to Ross Perot’s third-party candidacy pulling votes away from George H. W. Bush. A Review of Alan Abramowitz’s The Great Alignment: Race, Party Transformation, and the Rise of Donald Trump, Yale University Press, 2018 and John Campbell’s American Discontent: The Rise of Donald Trump and Decline of the Golden Age, Oxford University Press, 2018. This past spring brought us the two ambitious and instructive analyses of the 2016 election reviewed here. Both reflect a long tradition of election studies that seek to understand nation-wide individual voter choices as outcomes of voter attitudes and demographics. They proceed on the assumption that such explanations generally override details like those thrown up by likes of the Electoral College. Abramowitz’s Great Alignment falls within this tradition, although it is enriched by more attention to the historical development of electoral preferences than the tradition typically provides. Abramowitz shows how a strong partisan alignment comprehending nearly all voters arose out of the breakup of the old New Deal coalition. Importantly, he finds that the white vote, the white working class vote more especially, was key to 2016 Republican presidential voting. John Campbell’s American Discontent posits that “only long-term trends” in the American economy, race relations, ideology and politics stretching back to the 1970s can explain Trump’s rise to power” (p. 11, Chap. 3). He argues that anxieties about the possibilities for upward mobility linked to racial competition mattered more than simple working-class economic discontent for Trump’s advance to the White House—anxieties complemented by ones about inner city crime and radical Islamic terror and that often turned out to be unsupported by the facts (p.77). Discontent is richly instructive about how aspects of national demography (e.g., income inequality, declining upward mobility, and poverty (pp. 34–63)) and public opinion (e.g., institutional trust, ideological and partisan orientations and polarization (pp.74–121) bear on Trump’s ascendance. The book is also attentive to the corrosive forces of deindustrialization. Campbell’s principal focus and major contribution consists of his tracing of those long-term trends, but the account is perhaps not long-term enough. For Campbell, the 1970s are the start to the strongly conservative, if not reactionary, strands of his trends and to the boosts given these by Nixon’s Southern strategy and aspects of the McGovern campaign that “undermined the Democratic coalition that had supported progressive social policy and labor interests in Congress since World War II” (p. 44). Yet he does not extend back far enough. Campbell writes as if his highlighted 1970s events created a conservative upsurge de novo rather than simply modifying one “conservative coalition” of Republicans and Southern Democrats into a Republican block. This “conservative coalition” begins to coalesce into the racist, anti-welfare, broadly inegalitarian coalition it would become in reaction to the 1938 Fair Labor Standards Act. With the emergence of this coalition such major post-New Deal reforms as the Voting Rights and Medicare/Medicaid amendments to the Social Security Act had to await the Congressional non-Southern Democratic majorities of the early LBJ years. Campbell bypasses reference to political scientists’ “three-party system” system of roughly 1938–1984 during which progressive welfare, labor market and racial legislation regularly— excepting a few liberal Democratic surges like that of 1964–1965—faced majority opposition from an alliance of Republicans and Southern Democrats (Poole and Rosenstein 2006). In short, Campbell is silent on the continuities linking the pre-President Nixon decades of the “conservative coalition” the Republican Southern conservatism plotted by Nixon’s Southern strategy and its realization in the 1980–1984 transformation of most White Southern voters and Congressional seats into formally conservative Republican ones, a development that continued on more grounds than Nixon’s 1969–1974 dog whistling. Campbell’s 2016 focus on national aggregate political preference and choice runs up against Hillary Clinton’s 2016 popular vote victory. Mistakenly, this national aggregate casts little light on the pivotal role of Trump-GOP successes in three Midwestern states—Michigan, Pennsylvania and Wisconsin—that had voted for Democratic Presidential candidates since 1988. Despite some historical deepening, Abramowitz focuses far more than Campbell on voter attitudes closer to voting time. He particularly emphasizes the vote framing role of “negative partisanship” and the more proximate motivating forces of economic and racial anxiety (pp. 5–8). “Negative partisanship” is a mode of partisanship marked by less enthusiasm for one’s favored party than greater animosity toward its opposing party. It dampens the electoral impact of candidate differences on local issues and nationalizes elections as well as polarizes electorates. Abramowitz also sharply focuses on economic and, above all, racial anxiety and makes a strong analytical case for a greater impact of racial/ethnic resentment than economic anxiety on voting. On his core White voting factor, Abramowitz finds that White racial/ethnic resentment exceeds White economic anxieties as a force at the polls, that it is key, alongside one’s Republicanism, to Trump primary and general election voting (pp. 139, 158); and he finds that racial/ethnic resentment and misogyny are principal differentiators of especially pro-Trump non-college White voters from college-graduate White voters (p. 157). He also explicitly focuses on a post-1970s White working-class vote shift toward, Trump as “what gave Trump his narrow victories in Michigan, Pennsylvania and Wisconsin” (p. 152). However, like Campbell, he does not much focus on how more idiosyncratic factors may have operated to determine the surprise 2016 swings in Michigan, Pennsylvania and Wisconsin. Two such idiosyncrasies may explain the crucial swings in question, the Jill Stein and Gary Johnson vote and the October 28 Comey letter to Congress. A Clinton loss of liberal votes to “third-party” candidates Jill Stein and Gary Johnson, especially the former, offers a potent account how Trump’s snatched victories in Michigan and Wisconsin, if not Pennsylvania; and in Michigan, Trump defeated Democrat Hillary Clinton by only 10,704 votes, far less than the 51,463 votes garnered by Stein alone. In Wisconsin, Trump’s margin over Clinton was 22,177 in contrast with Stein’s 31,006 votes. However, in Pennsylvania, Trump’s victory margin of 67,46 votes exceeded Stein’s 49,485 votes (Bump, 2016). A second “catch” confronting a “third-party” answer to the election is uncertainty about just what share of Stein and Johnson votes actually did cut into Clinton’s net support. Here, Nate Silver fortunately offers a seemingly judicious estimate: Stein and Johnson voters, given a two-party, would have voted about 35% for Clinton and 10% for Trump (or stayed home), yielding a 25% bonus for Clinton relative Trump. Using a 0.25 adjustment to factor the Stein-Plus-Johnson vote into the Trump-Clinton race duplicates the bottom line offered by a simple allocation of all Stein votes to a Clinton in in Michigan and Wisconsin, though not Pennsylvania. As for the Comey letter of October 28 that briefly reopened the investigation into Clinton’s emails, there is good reason to believe that its impact may have cut deeply enough into Clinton support from “late deciders” to have swung the election in all three Midwestern swing states, Pennsylvania included (Blake, 2016). Overall, it seems most unlikely that the combination of Stein-Johnson and Comey did not suffice to turn the race. This does not imply that states other than the ones stressed here did not matter. However, among states Trump won, only Michigan, Pennsylvania and Wisconsin are ones that Democrats have consistently won since Reagan’s pretty consistently durable 1984 reddening of the South and most of the non-Pacific west. These three rust-belt swing states aside, there is nothing about the 2016 election that Cowboy and Dixification accounts of the post-Carter GOP cannot explain. On the other hand, theories of the 2016 presidential election articulated in terms of citizen preferences and choices and their national aggregation, especially ones centered on racial anxiety, may serve well as accounts of Trump’s 2016 GOP nomination and portend a future extension of the GOP into Blue territory. Although local and historical specificity may sometimes generate such large as Napoleon attributed to trifles, a rising tide will tend to raise whatever it supports. On other notes, voter suppression also may have been decisive at the margins in swing states (Wine, 2017). Although it remains somewhat speculative as of this summer of 2018, there have been noteworthy indications that “fake news” of Russia-linked origin was especially heavy in Pennsylvania and Michigan (Denise Clifton, 2017). I write “somewhat speculative” because of the early fall publication of K. H. Jamieson’s masterful Cyberwar. Benko, Ralph. 2011. “Everything Economics Turns On a Trifle.” Forbes. 15 February 2011. Blake, Aaron. 2016. “How America decided, at the last moment, to elect Donald Trump.” Washington Post. 17 November 2016. Bump, Philip. 2016. “Donald Trump will be president thanks to 80,000 people in three states.” Washington Post. 1 December 2016. Clifton, Denise. 2017. “Fake News on Twitter Flooded Swing States That Helped Trump Win.” Mother Jones. 28 September 2017. Jamieson, Kathleen Hall. 2018. Cyberwar: How Russian Hackers and Trolls Helped Elect a President. What we Don’t, Can’t and Do Know. New York: Oxford University Press. Poole, Keith T. and Howard Rosenthal. 2007. Ideology and Congress. Livingston, NJ: Transaction Publishers. Roebuck, Jeremy and Andrew Seidman. 2018. “’Paint Philly Red’: How Russian trolls sought to influence PA’s 2016 vote.” Philadelphia Inquirer. 19 February 2018. Wines, Michael. 2017. “Almost 17,000 Prevented from Voting.” The Independent. 27 September 2017. The ASA Political Sociology section is pleased to announce a mini-conference to be held prior to the ASA annual meeting in August. The morning sessions will center on populist politics, examining the rise of populist leaders and how they have transformed the political landscape, considering cases such as Donald Trump, Brexit populists Nigel Farage and Boris Johnson, Viktor Orbán in Hungary, Rodrigo Duterte in the Philippines, and Andrés Manuel López Obrador in Mexico. The afternoon sessions will have a number of open panels, depending on submissions. We welcome papers on topics related to the historical rise of labor, political parties, gender and/or race politics, immigration issues, the media in politics, social movements, and other topics related to the current political situation. We similarly welcome papers that take a comparative and/or historical perspective, or that investigate questions in other countries going through challenging political processes. In order for the organizers to read the abstracts and shape the sessions for the conference, please send your abstracts to us by February 1st, 2019. Please submit your abstracts to the panel organizer who fits your paper topic. Conference participants and attendees will be asked to contribute a participation fee of $25 for faculty and $15 for students to cover incidentals and a small lunch. We look forward to seeing you in New York!